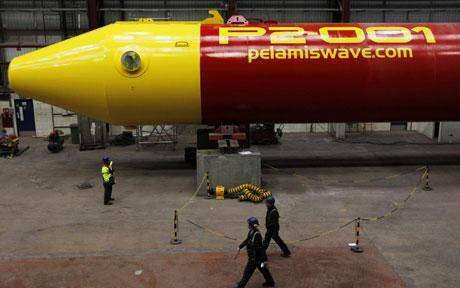 The Pelamis P2 is the second-generation Pelamis Wave Energy machine and includes a number of significant design improvements. 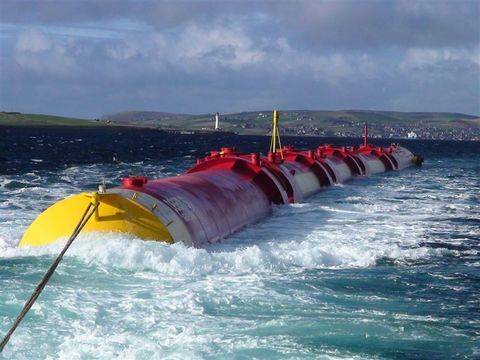 The P2 design has been sold to utility customers E.ON and ScottishPower Renewables and are currently being tested for a number of commercial scale projects. 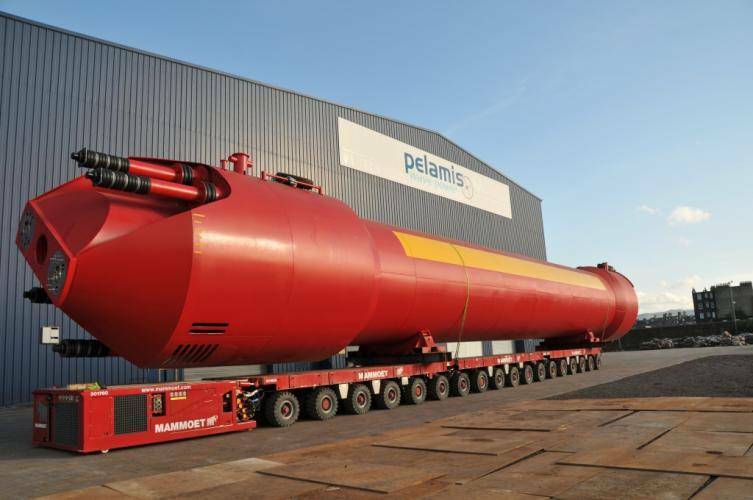 At 180m long, 4m diameter and weighing around 1350 tons (mostly sand ballast), the P2 Pelamis is wider, longer and heavier than the P1 design machine. 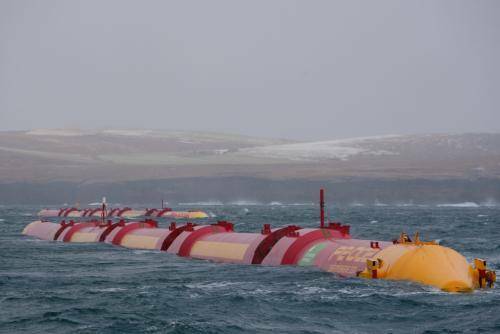 This allows the Pelamis to capture more energy while substantially reducing the cost per MW. 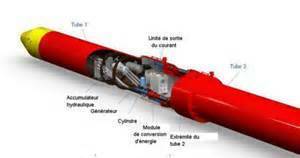 Comprised of five tubes with four joints, the P2 has an extra tube section and an extra power module. An improved power take off system for the P2 allows higher efficiencies, enhanced control resolution and increased reliability. The joint angle envelope has been increased allowing larger joint movement to significantly increase power absorption across sea states. 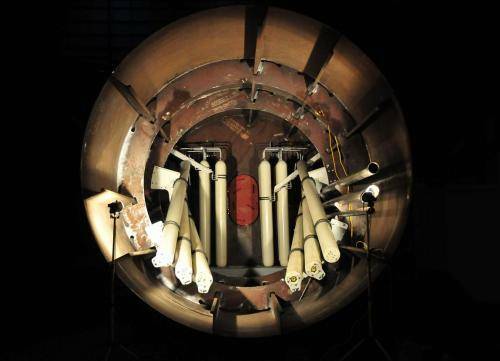 Rather than the separate sections of the P1, power modules are now integrated into the main tube sections. A universal joint allowing two-degrees of freedom replaces the single degree hinged joints. 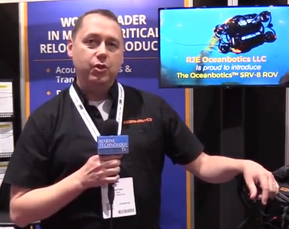 These changes reduce the number of costly end-cap fabrications in the machine. 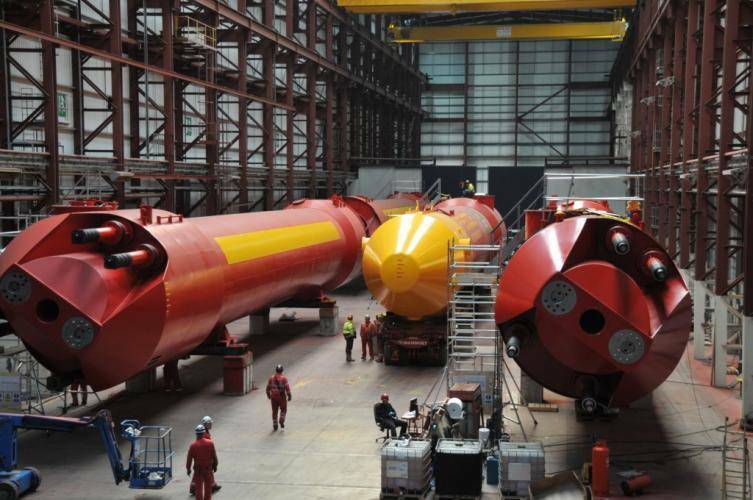 The tube connection process has been simplified and de-risked for the P2, expanding structural and mechanical supply chain options. 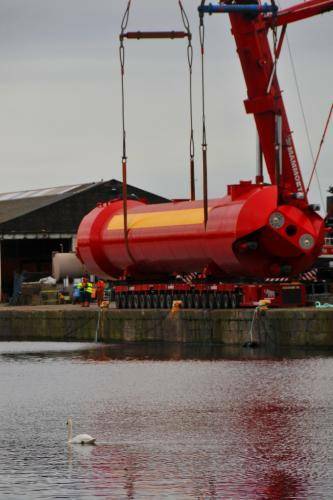 The Pelamis machine is made up of five tube sections linked by universal joints which allow flexing in two directions. 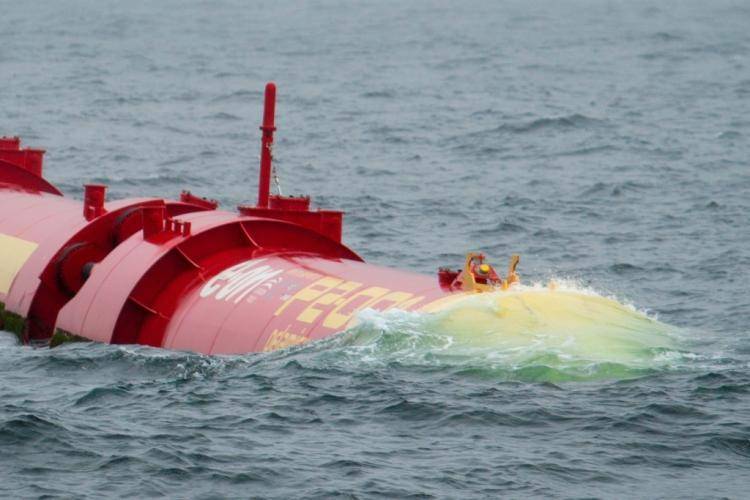 The machine floats semi-submerged on the surface of the water and inherently faces into the direction of the waves. 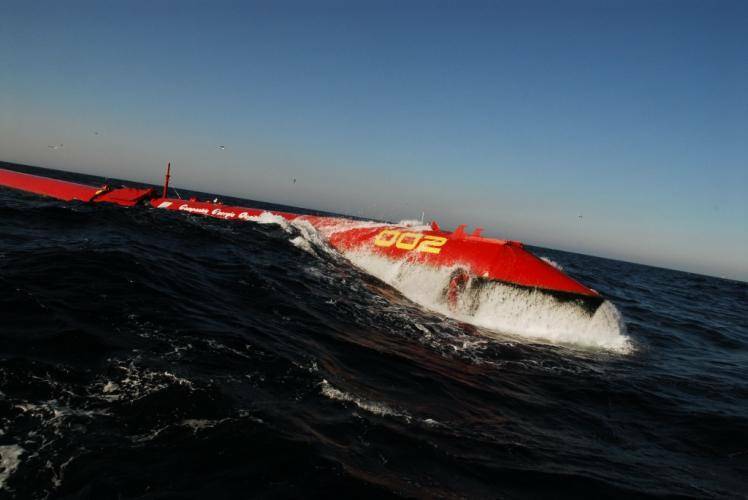 As waves pass down the length of the machine and the sections bend in the water, the movement is converted into electricity via hydraulic power take-off systems housed inside each joint of the machine tubes, and power is transmitted to shore using standard subsea cables and equipment. Each of the power take-off units at the joints of the machine are identical, and operate independently from each other with redundancy of all main components. 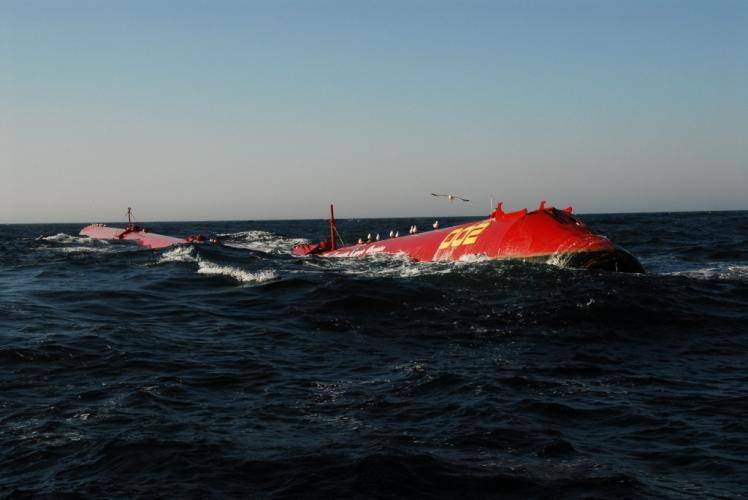 The power take-off system is driven by hydraulic cylinders located at the joints which resist the wave-induced motion and pump fluid into high-pressure accumulators, allowing power generation to be smooth and continuous. 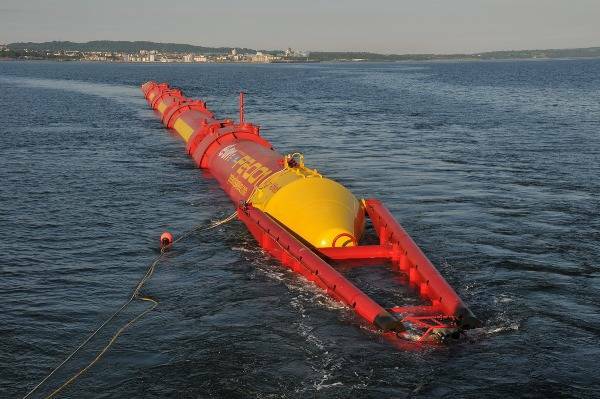 Control of the resistance applied by the hydraulic cylinders allows generation to be maximized when waves are small, and the machine response to be minimized in storms.